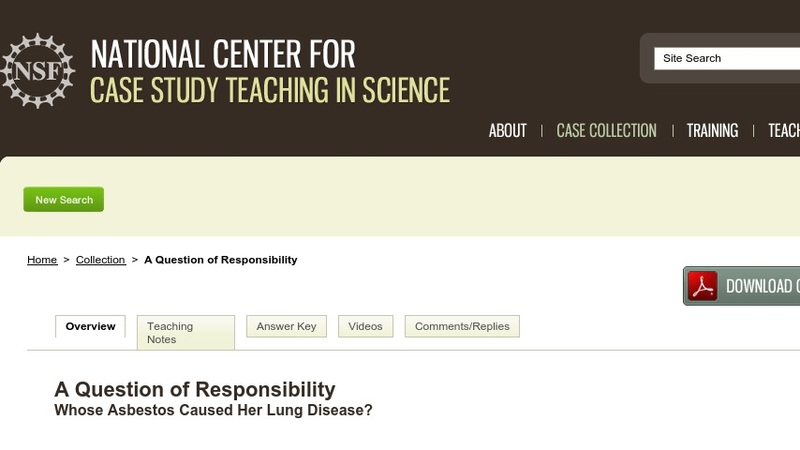 A Question of Responsibility Whose Asbestos Caused Her Lung Disease? Most students are aware that asbestos is a health hazard, but don’t know that “asbestos” refers to a variety of minerals with both useful and harmful properties. In this case, students answer questions they have about asbestos in the context of a personal injury lawsuit. They learn about different asbestos types and uses, as well as how people are exposed to and harmed by asbestos. Students apply what they learn to the lawsuit presented in the case as well as in a follow-up activity in which they weigh the risks of leaving asbestos in public buildings against the risks of removing it.